Hi loves! I'm continuing with a gorgeous Fall release today, from Pahlish to be exact. For September Pahlish released 7 gorgeous shades belonging to the Matters of Consequence collection, inspired by the book "The Little Prince". The polishes are so versatile in color and finish and there really is something for everyone. These shades are being restocked September 13th. Let's take a closer look! All pictures are taken under artificial lighting which highlights a holographic finish and slightly washes out smaller details like glitter. Pahlish Asteroid B-612 is a smoky plum holographic with soft taupe shimmer. That holo O.o! It's SUCH a stunner. Perfect formula too, I used 2 smooth coats for even coverage and finished with a shiny topcoat. Pahlish Coquettish Creature is a smoky charcoal taupe cream with bright violet flakes. The violet flakes have a duochrome quality to them, depending on the light and angle they'll flash other colors as well. This shade felt quite sheer on the first coat but the second coat evened out everything. I finished with a shiny topcoat. Pahlish Draw Me a Sheep is a crisp white cream with a mix of soft violet-blue shimmer and platinum flakes. Sorry for the lousy pictures, I have not yet mastered the technique to photograph these pure whites. They freak out my camera, washing out all pretty detail likes the platinum flakes. The sample formula on this one is different than the one being sold, so your experience might be different than mine. Draw Me a Sheep applied nicely, especially for a white. I usually don't really bother about the first coat, I just want to put down an even enough base so I can use the other layers to smooth it out, which is what I did here. I hesitated adding a third coat but was scared that there were bald patches you can only spy with your camera so I did use 3 coats, but 2 looked nice as well. I finished with a shiny topcoat. 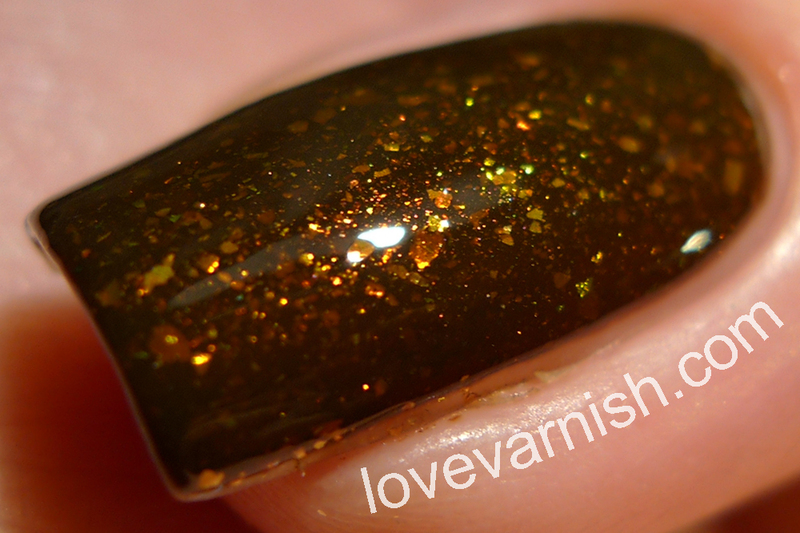 Pahlish Drawing Number One is a rich caramel brown jelly with gold, copper, and ultrachrome copper flakes. If you like those beautiful/ugly shades, this one will be right up your alley! There is a slight green hue to the brown and I liked it best at 3 coats to build up the intensity. The flakes create such a gorgeous finish! Finished with shiny topcoat. Pahlish Laughter of the Stars is a delicate seafoam cream with a soft holographic finish. What a cutie! With the first layer I was a bit scared the polish would look "dirty" on me (it happens with mints, blues and peaches sometimes) but luckily it became prettier when building it up. It's a bit sheer so 3 coats were needed for a nice, opaque finish. The holographic effect isn't superstrong but I like that, this way it doesn't grey out the base. Finished with shiny topcoat. Pahlish Little Baobabs is a rich olive green holographic with scattered ultrachrome flakes. Yeah, when my package arrived I took off my gel mani (after 4 days) just so I could wear THIS. The more earthy tone of the green, the flakes, the holographic finish.. YES! It's amazing. When you apply it, it looks a bit dull, but then you slap on some topcoat and it comes to life, it's mesmerizing ♥. I used 2 coats and finished with shiny topcoat. Great application as well! Warning: Little Baobabs DOES stain. I used it over a combination of Duri Rejuvacote and Cirque Colors Holdfast, and I still had some yellow staining when I took it off. Pahlish Radiation of the Sands is a rich goldenrod yellow cream with a mix of gold and copper flakes. Another one of those shades that can be considered a beautiful/ugly color. I personally LOVE ochre yellow shades, I actually bought a top the other day that's quite close to Radiation of the Sands in color. The formula is good, it does build up in intensity so I used 3 coats, but I had no application issues whatsoever which is awesome for a yellow! Finished with shiny topcoat. This complete set is full of win in my opinion. Different shades, lovely finishes and great formulation on each shade, even the ones that needed 3 coats. It's the versatility that's so attractive and makes it a set that offers something to everyone. My favorites are Little Baobabs and Radiation of the Sands. What do you think of this collection? And which shade is your favorite? Tell me in the comments! Pahlish is a US based indie with regular restocks and reasonable international shipping rates. You can find more info in the webshop!